Prevent "sneakers with peepers" from looking over your shoulder onto your private computer world. The ICUcopyclip attaches to your computer monitor to let you see who's 'coming up' and what's 'going down' behind you! 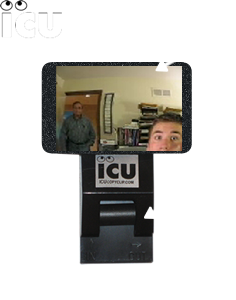 The "ICU" is a monitor mounted adjustable rearview mirror (1.25" x 2.25") enabling computer users to see the area behind their workstation. Below the "ICU rearview" is the "copy clip" that will hold one or more documents closer to your computer screen than any other document holder! Perfect for copying or just to keep those important notes handy and off your desk! To purchase just click Order or watch our Demo!